To make this Ormus Oil I took Extra Virgin Cold Pressed Olive Oil and added Dead Sea Salt and Sea90. Then I shook it up sporadically the next 3 days while I let it sit in a M.E.O.W. device. Finally I filtered out the salt and added Noble Shungite powder. Known as the "Stone of Life"
Every scientist investigating Shungite, declares it to be miraculous. Shungite is a black stone that is usually shiny and intense in appearance. It has a hardness of 3.5 – 4 and is often referred to as “black carbon”. Shungite is a natural composition of primarily amorphous graphite (carbon), crystalline silicate particles and other minerals evenly distributed throughout the stone. The carbon in Shungite gives it catalytic abilities, electro-conductivity and chemical resistance. Its complex composition of materials, interesting structure and amazing properties make Shungite quite unique. Found only in the northern Russian district of Karelia, Shungite was formed about 2 billion years ago. Shungite is composed of nearly all the elements of the Periodic Table. Though it is commonly known that not all chemical elements are beneficial to life forms, a surprising feature of this mineral is that only its health-giving components are absorbed by water. Moreover, experts have reason to believe that water contained in Shungite deposits gave birth to life, because its natural structures and complexes are so similar to those of a living cell. Shungite outward appearance resembles anthracite, a compact and lustrous coal mineral. It also resembles black coal, most likely because it contains fullerenes. There are two grades of shungite available from Russia. The lower grade contains 30-50% carbon (called black shungite) and has a dull appearance very much like coal. The higher grade, referred to as the silver form—also as elite or noble shungite—has a carbon content of 80% or more (and a correspondingly higher fullerene content). It is shiny and looks very much like the mineral known as galena. Only 1% of shungite is in this form. Both grades will work to enhance water but the silver elite/noble form works much faster. 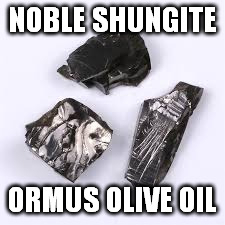 While elite/noble shungite has a higher concentration of carbon (and fullerenes), it is brittle and does not lend itself to cutting and shaping. Black shungite can be very therapeutic when carved in spherical, pyramid and conical form. Spherical black shungite is “turned on” in water as it rapidly fills the water matrix with the patterns and codes for balance and harmony. Irregularly shaped shungite has a more powerful effect on the physical body when placed in water. It is gently cleansing and rejuvenating at the cellular level. Spherical forms of shungite cleanse and harmonize the energetic body, (emotional, mental, spiritual). Fullerene is a molecule consisting of carbon atoms and is the third after diamond and graphite allotropic form of carbon. 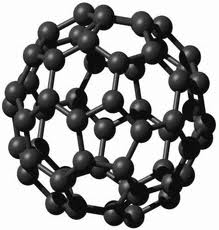 Fullerenes can be of a different type C60, C70, etc., depending on the content of carbon atoms. The most stable and best studied - is the C60, containing 60 carbon atoms. Fullerene is the only molecular form of carbon, in contrast to the diamond and graphite, which are only crystalline forms with a certain spatial arrangement of carbon atoms in the lattice. Nature brought together in one object, many contradictory concepts. Fullerene is a link between the organic and inorganic matter. This is the molecule, and the particle, and the cluster. The diameter of the molecule C60 is 1 nm. If you look inside the fullerene, we find only an emptiness pierced by electromagnetic fields, containing "nothing" - a vacuum enclosed in a carbon shell, as in the original container. And the walls of the container do not allow penetration into it of any material particles (ions, atoms, molecules). Fullerene molecule can be called a "vacuum bubble", which does not fit the well-known thesis that nature does not tolerate a vacuum. Vacuum and matter are two pillars of the universe that harmoniously united in one molecule. Fullerene is still a subject of research for the scientists around the world in the field of chemistry, physics and medicine. You cannot eat it (yet! ), but you can drink it. Among the fundamental properties of fullerenes, which are apparent at the level of both cell and whole organism, it should firstly be noted its antioxidant properties which suppress the processes of peroxidation and free-radical oxidation. Getting in our body, fullerenes behave as the most powerful and most long-acting antioxidant, as a means of fighting with free radicals, so-called oxygen atoms, which lack a single electron, which they greedily taken away from any living cell, the genetic spiral. Antioxidant activity of fullerene in the 100 - 1000 exceeds the effect of known antioxidants (eg vitamin E, dibunol, β-carotene). Thanks to its acceptor properties, fullerene is able to selectively interact with other molecules, and in water environment to transfer these properties in an orderly layers of water at a considerable distance from its surface. Fullerenes normalize cellular metabolism, increase enzyme activity and increase the stability of the cell, including its genetic apparatus to external influences (heat, viruses, etc.). The regenerative ability of body tissues increases in its turn. Fullerenes normalize the nerve processes, influencing the exchange of neurotransmitters, improving the capacity of man and his resistance to stress. Besides, fullerenes have an explicit anti-inflammatory and antihistamine effect, thus relieving pain, suppressing the development of many allergic diseases and improving immunity. Fullerenes function even in ultrasmall doses and their effect even after single dose lasts for months. Fullerenes (also called buckyballs) look like soccer balls—molecular hexagons and pentagons bound together in a hollow cage or tube. They were named after the noted architect, Buckminster Fuller because they follow the same architectural pattern as the geodesic domes he created. About a billionth of a meter in diameter, fullerenes are incredibly stable. When propelled against a steel surface at 17,000 miles per hour, they literally bounce off. Clusters of fullerenes join diamonds and graphite as the third known form of crystalline carbon. Fullerenes were discovered in 1985 by Robert Curl and Richard Smalley. Together with Harold Kroto they synthesized these three-dimensional forms of carbon while trying to simulate the high-temperature, high-pressure conditions necessary for the formation of stars. Their discovery won them the Nobel Prize in chemistry in 1996. The natural existence of fullerenes remained unclear until they were verified in deposits of Shungite . . .and since discovered in meteorites and in outer space. In 1991, Science magazine named fullerenes “molecule of the year,” calling them “the discovery most likely to shape the course of scientific research in the years ahead.” Scientists everywhere are researching fullerenes for their technological applications in material science, electronics, and nanotechnology. The rock deposit found in Russia known as Shungite is the only known natural source of fullerenes on Earth (with the exception of a few meteorites). The rock has been studied extensively by Russian scientists, but only within the last few years has information regarding Shungite reached the Western world. According to Russian research, fullerene-rich Shungite has the ability to neutralize numerous forms of negative energy. It attenuates electromagnetic emissions essentially providing protection from electromagnetic fields. Shungite has been successfully used for many years in Russia to assist patients with depression, trauma, and other emotional and psychological disturbances. Special shungite chambers have been constructed for this purpose. There are at least 3 theories explaining how Shungite may have formed. Primitive microscopic organisms existed in shallow areas of the ancient sea. These eventually produced Shungite. Billions of years ago, a gigantic meteorite could have brought a part of a decomposed planet and landed in what is now known as Karelia. This decomposed planet had carbon based life forms. A side note: Fullerenes WAS recently found in outer space. Shungite could have formed when a volcano erupted since its form and structure are similar to volcanic ash. In the early 1700s, Peter the Great of Russian had a palace built near a “magic” spring. That area became the first Russian resort and was named “Martial Waters” after Mars, the god of war. Back then, the Russians must have had an inkling about the powers of Shungite water because they used it to cure all kinds of issues and dis-eases including a weak stomach, vomiting, diarrhea, hypochondria, bile, scurvy, kidney problems and many others. Peter the Great required every soldier to carry a piece of the unusual stone in their backpack. Many believed that the reason the Russians prevailed in the battle of Poltava was because the soldiers had the Shungite with them. Today, the water at the Martial Resort continues to pass through the thick layers of Shungite, exclusive to that area. Its extensive diversity of healing properties makes Shungite a mineral that is unlike any other. Scientists who have studied, investigated and worked with Shungite unanimously agree that it is a “miracle” mineral. Some words that have been used to describe Shungite’s miraculous powers are: treats, saves, purifies, heals, cleans, protects, improves, normalizes, neutralizes, restores, regenerates and even grows. Shungite is the ideal stone to have on us because it heals on all levels. Shungite is the stone of regeneration and revitalization. Shungite initiates cell rejuvenation and enhances cell and dna / rna repair. Shungite eliminates, kills and absorbs everything that can do harm or impose a hazard to all living beings. Shungite focuses on restoring all that is healthy, beneficial and useful for us. There is much to appreciate about Shungite. Shungite eases headaches, stomach aches, backaches, rheumatism, nerve pain, nervousness and skin spots. It can stabilize our organs, our blood pressure, our bio light field and our immune system. It can clear our respiratory tract, increase our sexual activity and help us sleep. It is also beneficial for our gastrointestinal tract, liver, kidneys and metabolism and varicose veins. We all know that radiation exposure can cause heart and cancer dis-ease. Shungite is biologically active and can neutralize or lessen the intensity of high frequency electromagnetic emissions. This powerful stone can shield us from the electromagnetic radiation that comes from computers, microwaves, TVs, mobile phones, power lines, etc. Shungite pyramids are particularly beneficial against that harmful radiation. What is amazingly unusual is that Shungite can store electric current with out creating magnetic fields. Even more spectacular is that Shungite takes the negative frequency out of any electromagnetic field which is not in tune with our DNA Light pulse frequency. For thousands of years, the natural Shungite water from Lake Onega in Russia has never needed purification prior to drinking. Shungite is a more safe and effective method of “disinfecting” and cleaning our drinking water than boiling or using chlorine. One reason for this is because Shungite has strong antibacterial abilities. Shungite has the ability to eliminate almost all organic compounds (including pesticides), metals (including copper and iron), chlorine, bacteria, nitrates, magnesium and harmful micro-organisms from our water. Beginning in the 1990s, Shungite water filters were used commercially. During that time, many experiments and studies were conducted on Shungite’s influence on the human body. Scientists concluded that Shungite water was absolutely safe, non-toxic and consumable without the need to boil first. In one experiment, water was contaminated with concentrated groups of A and D streptococcus. After 30 minutes in Shungite water, both groups of streptococcus were significantly decreased. Drinking at least 2-3 glasses of Shungite water daily can treat or prevent digestive, muscular and / or neural system illnesses and increase blood circulation. Shungite water is also beneficial for the treatment of the following: acne, allergies (all kinds), anemia, asthma, cardiovascular dis-eases, chronic fatigue, common cold, diabetes, upset stomach, indigestion, gall bladder issues including inflammation, gastritis, immune system (weak), impotence, kidney dis-ease, liver dis-ease, pancreas dis-ease, skin issues including redness. Shungite water has an antihistaminic effect. After drinking Shungite water, there is a dramatic decrease of histamine in the blood stream, which helps reduce allergies. Shungite will help to balance conflicting energies that will arise during the shifting to higher rates of vibrating. As its frequency can and will align to those who begin to embrace and "wear" a vibratory signature that meets the future with love and light. Yet, Shungite will often come across as a stern and disciplined teacher, ready to impart its sacred wisdom with those who are committed to a higher path of evolving. One has a responsibility when working with the energies of Shungite, as its source is not to be taken lightly or by the faint of heart. The "ancient of ways" seems to echo through from the Shungite gemstone; Older Souls will be able to "hear" this inner language coming through. Preventing one from the burden of negative attachments, Shungite quickly disperses such toxins away from the individual. Replacing one with more positive energy, the enduring nature of Shungite is constant and unrelenting, never waiving from its strong centered source. Shungite can and will propel one along the direction of his/her path, keeping one focused, grounded and centered at all time. Replenishing one with protection, Shungite works in the "background," most times one is not even aware of its presence upon the body. Blending with one's highest good and intention, Shungite truly comes across as a magical stone with many capabilities not yet revealed. Marveling at the essence of Shungite will expose one to its higher rate of vibrational impulse, placing one in a better state of mind and positioning one with a "shield of protection" at all times. Humanity will require the healing force of Shungite as the dimensional frequencies continue to shift and thus, adapting and adjusting will be required by one and all on the planet. To order your own piece of this wonderful mineral called Shugite please check out this store. They have so many great various Shungite products.